Best Friends, originally uploaded by Lukasmummy. Credits: Layered template (Facebook Fan Exclusive April Templates) and I Love My Boy both by Jen C Designs. Font is Pea Bonnie Script by Amanda Bottoms (Fonts For Peas). Journalling reads: There could never be another, To make me feel the way you do, Oh we just get closer, I fall in love all over, Every time I look at you, I don’t know where I’d be, Without you here with me, Life with you makes perfect sense, You’re my best friend – My Best Friend by Tim Mcgraw. Forever, originally uploaded by Lukasmummy. Credits: Layered template (February Template Challenge) by Elizabeth Albers (Scrapping With Liz) and Princess Wishes by Laura White (C.W Picket & Company). Fonts are Times New Roman and Prestige Elite Std. Lyrics from I believe When I fall in Love by Stevie Wonder. Beach Babe, originally uploaded by Lukasmummy. Credits: Chocolate Kisses and Chocolate Kisses Alpha both by Bonnie Blou Designs. Fall Asleep On The Way Home, originally uploaded by Lukasmummy. 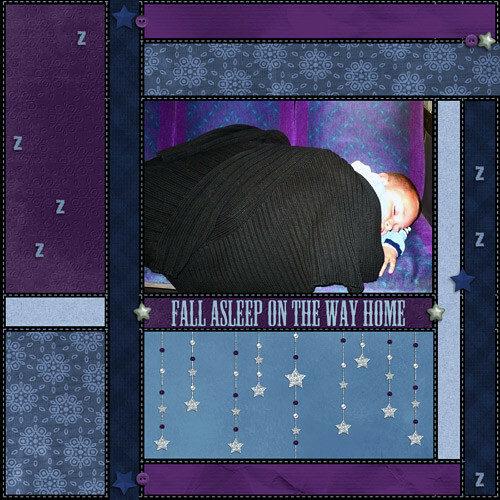 Credits: Layered template (Freebie Template 54) by Chrissy W and Winter Merriment (slightly recoloured) contributions by Sandy Collins (By Sandy Creations), Jaime Rhinehart (Cjoy2Day Designs), Gabby Palmer, Jewel Goodwin (Mad Genius Designs) and Melissa Robinson (Melly Scraps). Font is Mesquite Std. 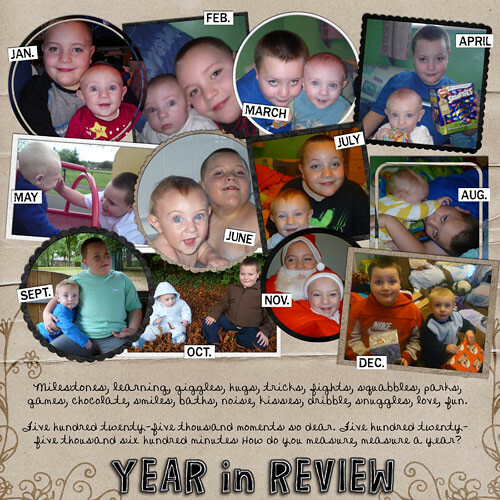 Year In Review, originally uploaded by Lukasmummy. Credits: Layered template (Year In Review Template 2) by Gina Miller and P365 Basic Papers by Laura White (C.W Picket & Company). Font is Sandee Script by Allie Hoopes. Journalling reads: Milestones, learning, giggles, hugs, tricks, fights, squabbles, parks, games, chocolate, smiles, baths, noise, kisses, dribble, snuggles, love, fun. Five hundred twenty-five thousand moments so dear. Five hundred twenty-five thousand six hundred minutes How do you measure, measure a year? Love My Family, originally uploaded by Lukasmummy. Credits: Layered template (Easy As Pie Template Challenge 5), by Beckie (Shabby Princess CT), Strung Along Frames by Rochelle Hall (Man In The Moon Designs), All Together Blog Train WordArt (altered) by Kathy Winters, Family Memories by Ivonne Ivett (Craft-tastrophic Designs) and My Heart Shines and Heart Genius Volume 1 by Jewel Goodwin (Mad Genius Designs). Font is DJB TracyL by Darcy Baldwin. Journalling reads: Sometimes when I am sitting by myself. Those quiet moments when not with no one else. I’m mesmerized by all the many good things in my life. Lyrics from My Lovely Family by Yo Gabba Gabba and The Roots.